Most of us know Eric Gill (1882 – 1940), the renowned typographer and sculptor. Few, however, are familiar with his younger brother, MacDonald “Max” Gill (1884 – 1947), who doesn’t even have a proper entry on Wikipedia and nothing at all in the DNB. Hence the title of this exhibition, which opens today at the Pitzhanger Manor gallery in Ealing. My first introduction to Max Gill was at last year’s Mind the Map exhibition at the London Transport Museum. I ended up featuring him strongly in my review, as he was unquestionably one of the stars of the show itself. Before and after the First World War, he was on the roster of commercial artists engaged by the Underground’s talented talent-spotter Frank Pick, and it was said that commuters actually missed their trains in order to enjoy Max’s cartoon map of central London: Wonderground. This poster, along with its ink preparatory sketch – plus other Gill items from the LTM collection – feature in this show. But Underground posters are a tiny fraction of Max Gill’s output and not even particularly representative of his life’s work. A formally-trained architect, Max – like his brother – was a talented typographer and calligrapher, much evidenced here. 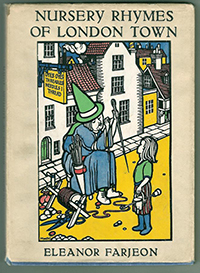 You will also see his expertise in architectural illustration (naturally) but there are plenty of examples of his work in tapestry design, heraldry, monuments, book covers, invitations, advertisements, large-scale murals. He was unapologetically a commercial artist; a jack of all trades, and yet master of most of them. Compared with Eric’s modernism, Max’s work is highly detailed, drawing much more on the past. But look at his designs for the 1938 Empire Exhibition in Glasgow and you’ll see his deco elements, delivered effortlessly. If he is remembered for anything, though, it will be his maps. They are exquisite, colourful, funny, playful, large, propagandistic (one of his main clients was the Empire Marketing Board). Visual puns abound. Dozens of examples feature in this exhibition. 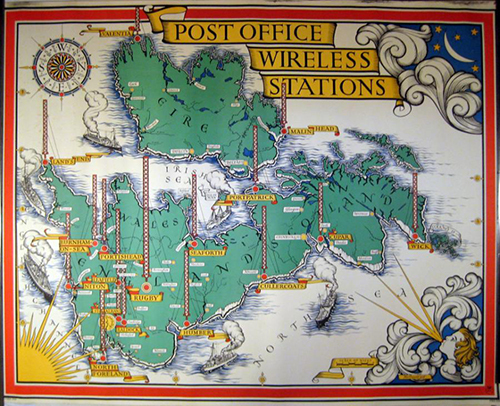 Post Office Wireless Stations, 1938. Max Gill had been married for twenty years when in the late 1930s his private life became complicated when he fell in love with his god-daughter, the attractive Priscilla Johnston, 26 years his junior. This is Johnston as in Edward Johnston the typographer of London Transport’s typeface, friend of the Gill brothers and mentor of Eric in particular. You see, Priscilla was his daughter. I mention this only because in the show are two letters from 1938 in reaction to this situation breaking cover: one from Johnston to Priscilla, his daughter – forgiving; and one from Eric to Max – the opposite, berating. Both writers, as one might expect, had beautiful handwriting. There is also a rather nice letter, after Max’s death from his first wife Muriel to Priscilla. These letters are in addition to diaries, notebooks, sketchbooks, Max’s pens, nibs, rulers, T-square, tools of his trade. Even the brass plate from his architecture practice. So Out of the Shadows is a very intimate exhibition as well as being a very complete one. 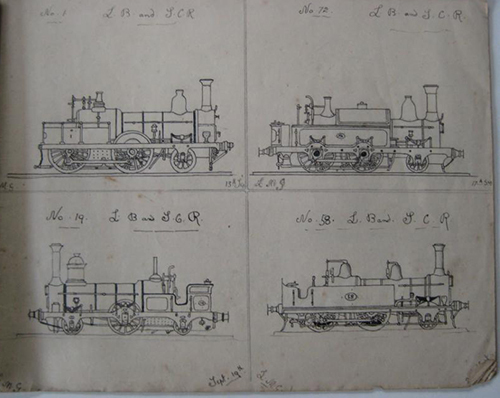 Notebook: Trains, aged 12, 1896. Architectural sketch. Wisborough Green, 1935. 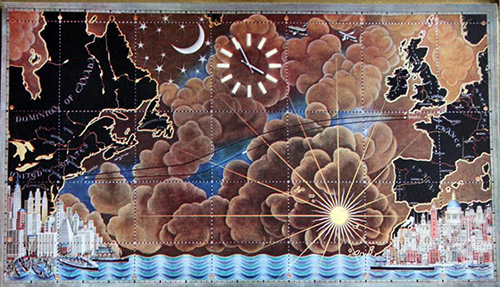 Mural of North Atlantic for RMS Queen Mary. This show is curated by Max Gill’s great-niece, Caroline Walker, alongside Edward Johnston’s grandson Andrew Johnston and Andrew’s wife Angela. The Johnstons provided many of the exhibits and personal memorabilia featured in this show. Caroline has determined to bring the artist’s life and work to a wider audience. A book is in the pipeline, but meantime visit her MacDonald Gill website and sign up to her newsletters which you’ll receive from time to time. There is a good gallery of Max’s work there too on this page. So. Out of the Shadows. A one-man exhibition of the most charming and breathtaking inter-war commercial art. I shall definitely go again, probably several times. You should too. And it’s free. The show runs until 2 November. Information here. I don’t really wish to besmirch our blog with these images, but I feel strongly about this. As we all know, this year marks the 150th anniversary of the world’s first ever underground railway system. The London Transport Museum has done a great job of celebrating this huge London achievement and we, London Historians, have contributed in our modest way, with more in the pipeline. 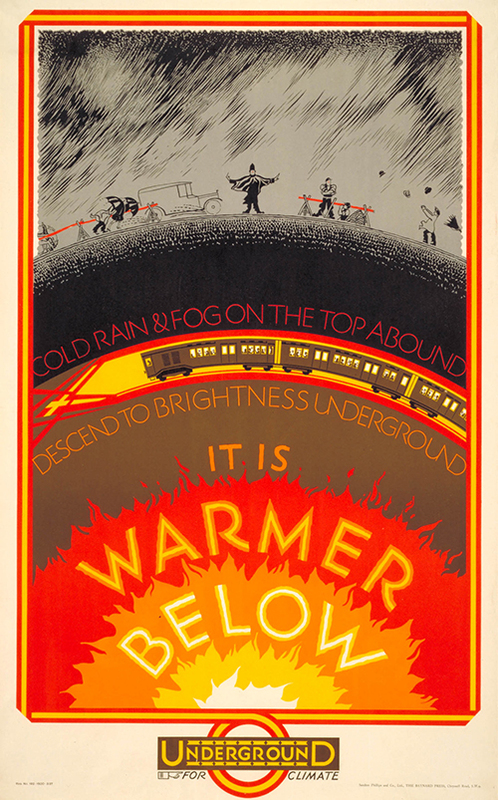 If you haven’t yet been to LTM’s fabulous exhibition of Tube posters over the years, you really must. Truly inspiring. There’s also a large selection here. 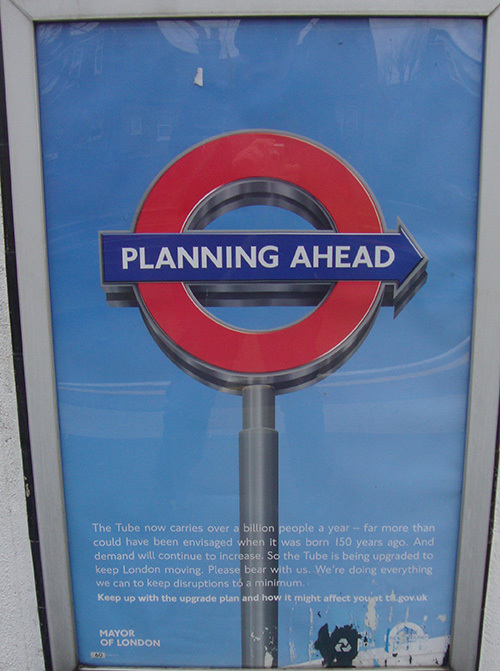 So how do the posters of 2013 – the Tube’s big anniversary year – shape up against the best from days of yore? Well, just take a look at these examples. 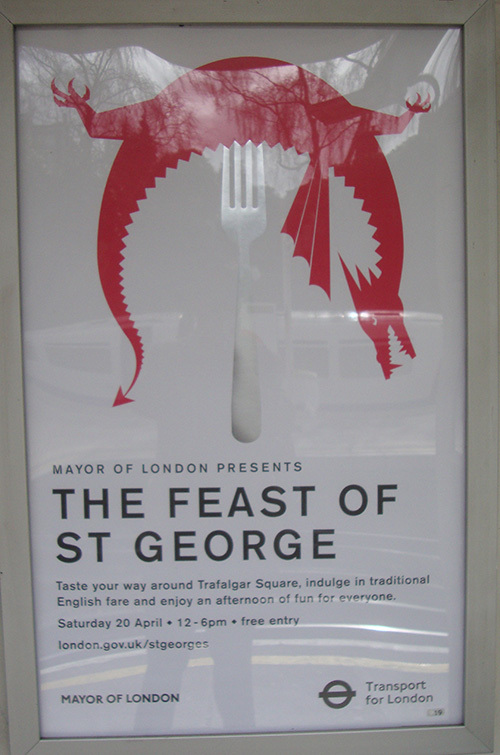 Not too bad, admittedly, a strong idea which links St George’s Day with eating out. 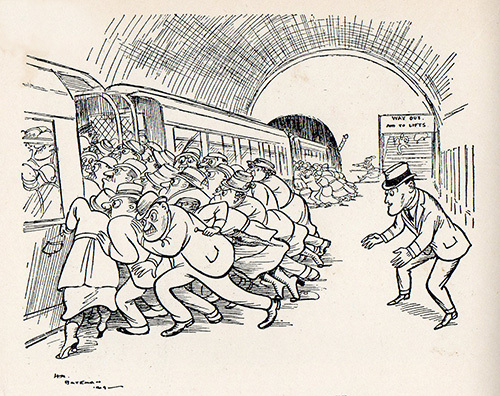 Bossy poster on the left cannot match Fougasse’s charming cartoon treatment of good Tube behaviour from the 1930s. Adobe Illustrator and Johnston Sans font file, and Bob’s your uncle. Awful. 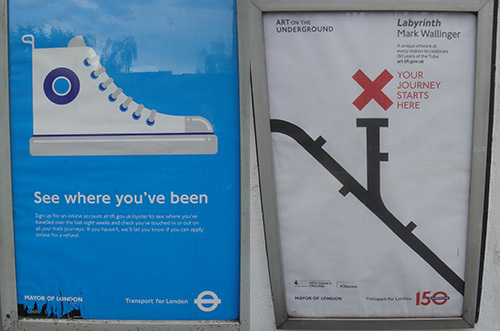 “Art on the Underground.” The irony. Possibly the worst of them. Is this Transport for London’s best tribute to the commercial artists, painters, calligraphers of the past? Our city is the home to some of the most talented illustrators on the planet, acknowledged worldwide. Many of us know one or two of them. I know I do. So why, TfL, what’s going on here? Who’s responsible for this drek? It’s the end of April. There’s time to put things right. Our – and all proud Londoners’ – challenge to you. Update: Turns out these items are from the GLA, not TfL (hat-tip to Hazel Baker on Facebook) – hence, presumably Ken Livingstone’s Mayor of London propaganda tag, something Boris chose to retain. So, too many cooks is a factor. I tend to avoid stuff that is widely covered, especially if I can’t bring anything significantly new or different to the party. But the occasion must be marked. 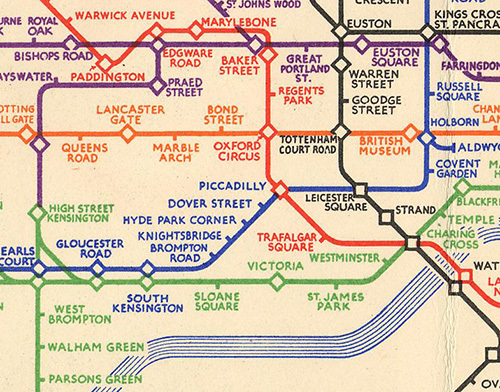 Today it’s exactly 80 years since the “modern” version of London Underground’s tube map was published. 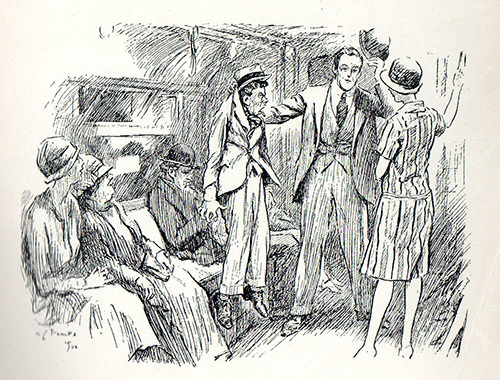 It was a foldy pocket version, an item which was common enough to London’s commuters previously and indeed to this day. The big difference was that Harry Beck‘s design was an instant hit with the public and apart from tweaks and updates, it’s essentially still the same map. 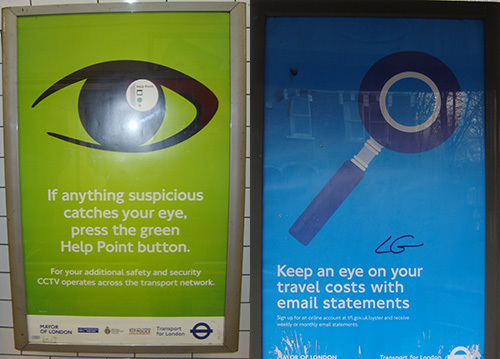 The most noticeable updates occurred early on in any case: diamond junctions changed to circular; station names changed from the tube line colour to black and from all capitals to mixed case. Harry Beck’s orginal 1933 map. 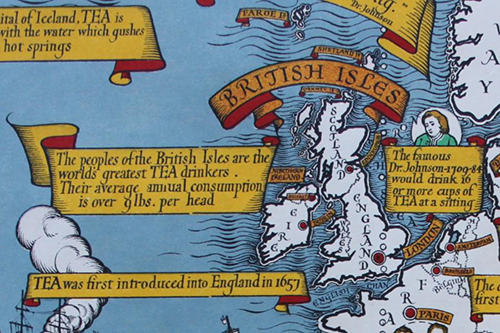 Harry Beck’s orginal 1933 map (detail). Over the past 80 years, millions have relied on Beck’s lovely map to figure out, at a glance, where they need to go. At last his efforts have been properly recognised with an English Heritage blue plaque on the house where he was born, in Leyton. 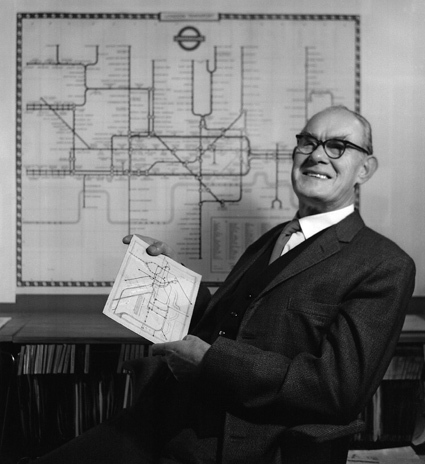 The honours were performed by Sam Mullins, current Director of the London Transport museum. The text of the plaque itself has been set in London Transport’s house typeface: New Johnston*. 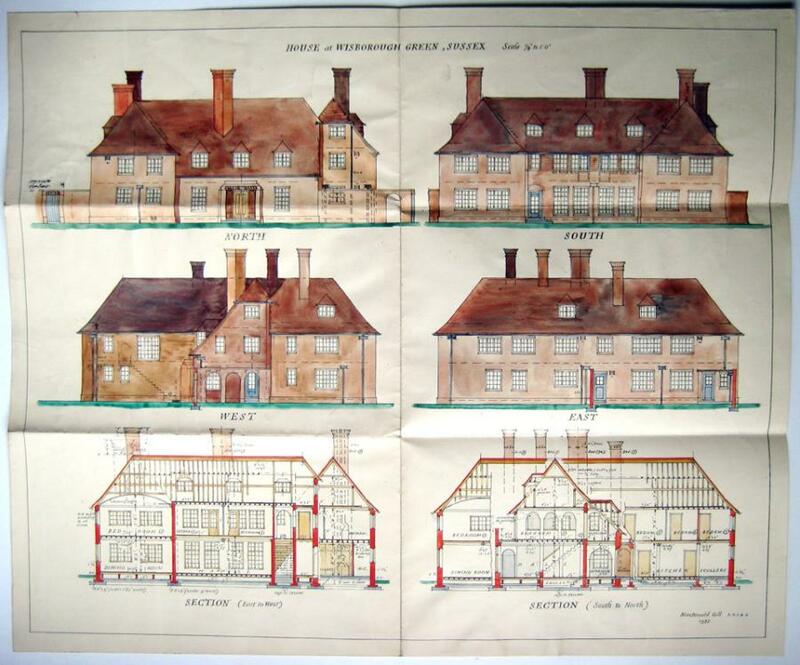 This has only been thus employed three times previously, for Frank Pick and Lord Ashfield, the two men who shaped the Underground in the first half of the 20C; and Edward Johnston himself, designer of the eponymous face. 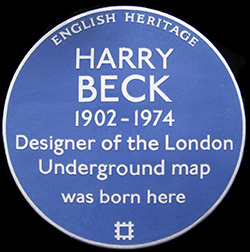 Beck worked for London Underground as a draughtsman from 1925, developing his map at home and in his spare time. During this period he liaised with management; initially they responded luke-warmly and with constant demands for changes, most of which Beck disagreed with. The map had its first public airing on 25 March 1933. Under a gentlemen’s agreement, only Beck could adjust of finally approve changes to “his” map, although London Underground breached this on several occasions, until eventually in 1960 Beck gave up the candle and his work on the map came to an end. Beck’s intransigence over his map gave him a reputation in some quarters of being difficult. But not humourless. Quite the opposite, in fact, as is clear in this happy-chappy portrait photo. But what’s that in his hands? It is most definitely not the Tube map. 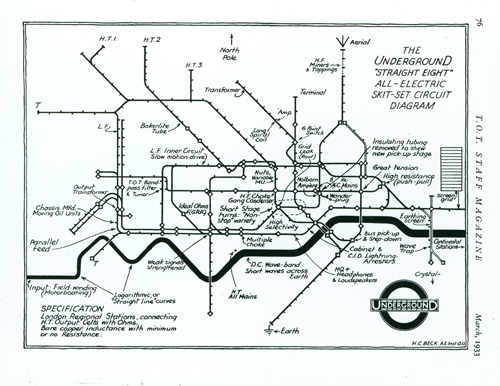 It is, rather, a spoof map based on a wiring diagram which was published in the London Underground staff magazine. This possibly gave rise to the theory that Beck’s inspiration for the Tube map was wiring diagrams. So he was happy to take the piss out of his own work, but that was very strictly his exclusive perogative! 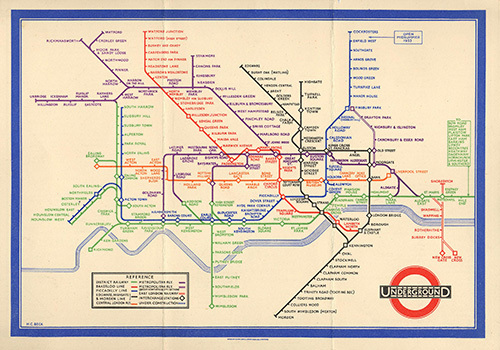 Harry Beck’s spoof Underground map. 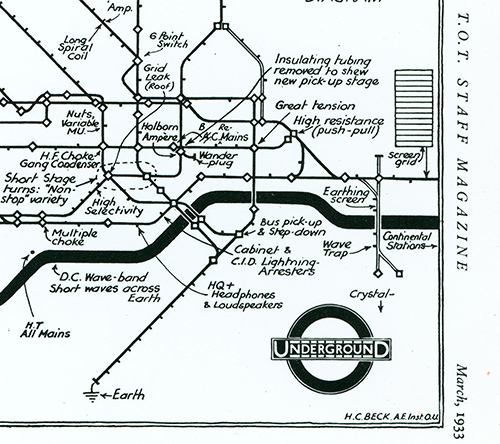 Harry Beck’s spoof Underground map (detail). * New Johnston is a near-imperceptible recent update of Edward Johnston’s original Johnston Sans. 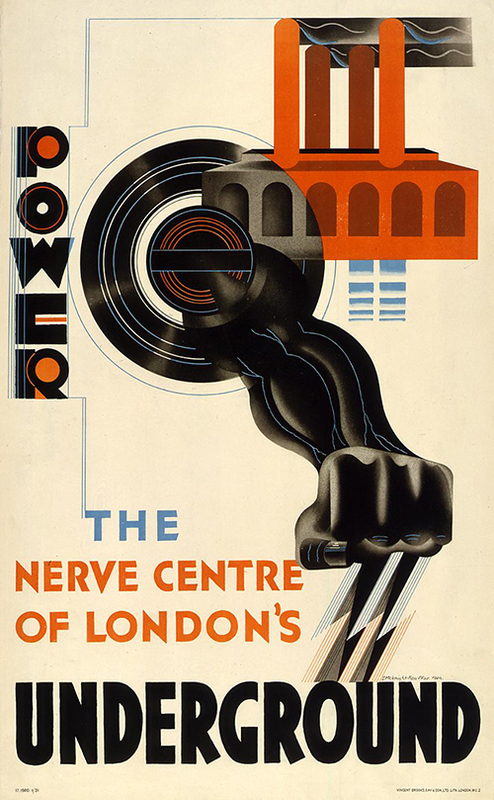 This is the name of a 1927 Underground poster by David Leete, to the right. 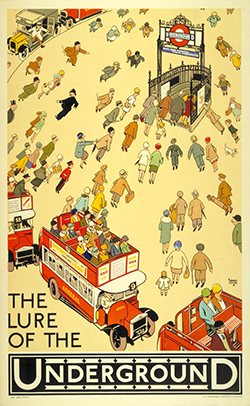 Its humour, warmth, colour and indeed lure is representative of the inter-war golden age of the Tube’s commercial posters. It is one of 150 which have been selected from over 3,300 to make up this celebratory new exhibition at the London Transport Museum in Covent Garden. You might argue that with so many to choose from, easy-peasy, they could hardly go wrong, and you’d be right. All are wonderful. But they haven’t been chosen simply as lovely art, but also what those who ran the network were trying to say about the Tube. Furthermore, they didn’t so much advertise the Tube itself (though many did that too), but rather what the Tube gives us, or more accurately where it takes us. So we have the theatre, all the major sports, museums, galleries, cinema, shows, exhibitions and the zoo. Despite not being especially close to a particular station, London Zoo has been the most frequently represented attraction. 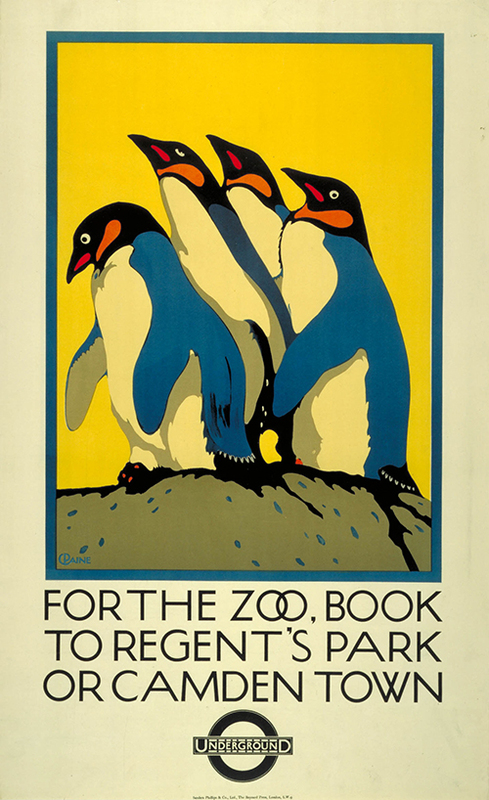 For the Zoo, Book to Regent’s Park. by Charles Paine, 1921. Undoubtedly, the richest poster era, as we have said, was the inter-war period. This was entirely due to the influence of one man: Frank Pick. Pick joined the Underground in in the early-1900s and almost immediately set to work in standardising how the organisation represented itself. The logo and the Johnston typeface (1913) was the basis of the branding. The job of posters was to be more than just informative. They had to be bright, clever, optimistic. Alluring. He began having them posted outside stations where they could be seen in good light and seen by all, not just paying passengers. He commissioned local talent, foreign talent, artists fresh out of art college and international stars such as Man Ray and Rex Whistler. And women! All Pick cared about was that the ideas were fresh and innovative and that the art was great. 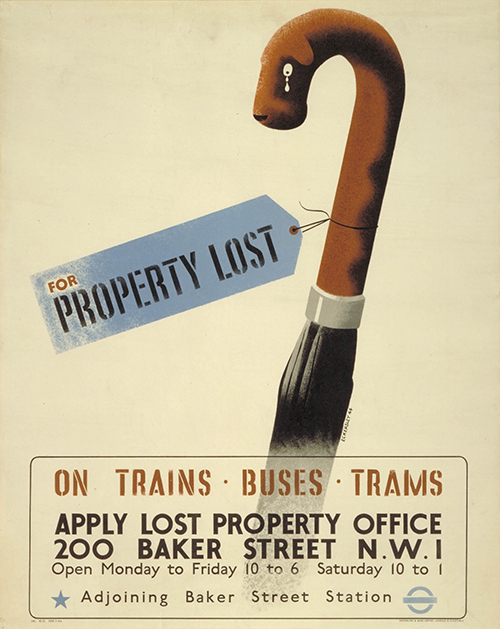 For Property Lost, by Tom Eckersley, 1945. Eckersley got the nod from Pick fresh out of art college in the 1930s and was still producing great Tube posters in the 1970s. Many of the problems of the Tube then are with us today. The system was often overcrowded, a situation exacerbated by peoples’ habits. Led by Pick, these were opposed with humour rather than bossiness. 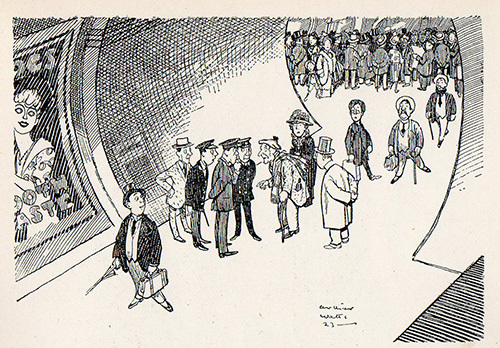 There is a wonderful series of cartoon posters by the great Fougasse (Cyril Bird), exhorting people to stand on the right on the escalators; have your ticket ready at the barrier; spread out along the carriage; don’t crowd the platform entrances. There are others which try to persuade people and businesses to stagger their start and finish times for a less crowded commute; for non employed people please only to use the Tube between 9 and 4. Presumably people putting grubby feet on the seats, eating stinky food and having to be reminded to give up seats for the old and infirm still lay sometime in the yobbish future. For this period of the posters, the Tube is telling an unapologetically positive and optimistic story: London is a glamorous, sophisticated and modern metropolis: get the most out of it on the Tube. It can be argued that there is a certain innocence, naivety about all of this. But this is commercial art after all, and we must be conscious of our cynical 21st Century mind-set. This is made clear, I feel, with the later 20th Century stuff. The work is “good”, but one feels that its too clever for its own good, even classics such as Fly the Tube and the one we all know and love, The Tate by Tube. Maybe it’s the photography, barely used before the 1960s. Congratulations to LTM for this wonderful show. Poster Art 150 continues until 27 October*. Entry is included in museum ticket, standard price £15. LTM run the enlightened policy which we applaud and endorse of year-long validity (other London institutions please take note). *UPDATE, 6 Sept: Poster 150 has been extended to 5 January. Here are just a few more examples to whet your appetite. It is Warmer Below by Frederick Charles Herrick, 1927. 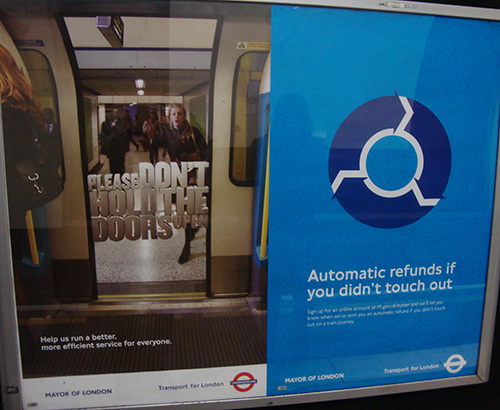 An oft-used theme was to use the Tube to escape the elements. The previous summer, Herrick did a poster called It is Cooler Below. 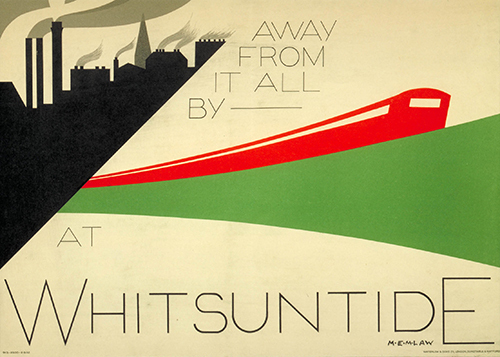 Away from it all by Underground at Whitsuntide, by MEM Law, 1932. Simple, beautiful, clever. Tube branding superfluous. Power. The Nerve Centre of London’s Underground. by Edward McKnight Kauffer, 1931. Most artists were expert calligraphers. Understated Tube branding on this one. There seems little point in my adding to the some of the wonderful writing about the Tube anniversary we’ve all been enjoying this week. So here’s a springboard to some good stuff. 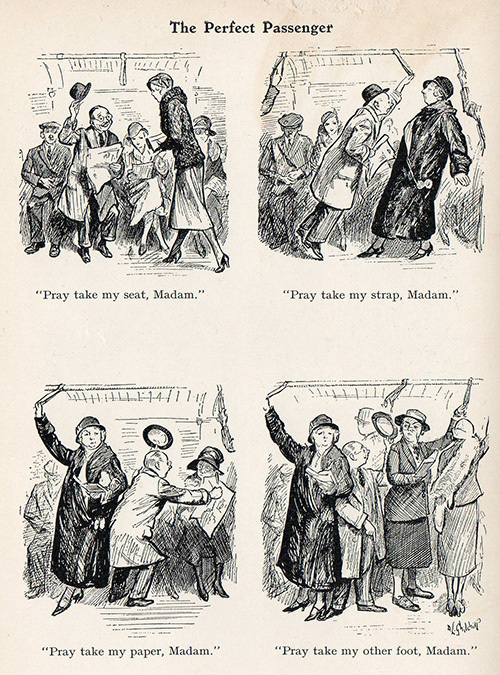 First off, London Transport Museum have done their own compilation from general press coverage, here. There’s also a comprehensive round-up on Vaguely Interesting (new to me – fun – check it out). 150 Years of the London Underground by the Great Wen. Caroline’s Miscellany has done at least four fabulous posts with lovely pictures: just go there. Happy Birthday, London Underground! from Wellcome Library. 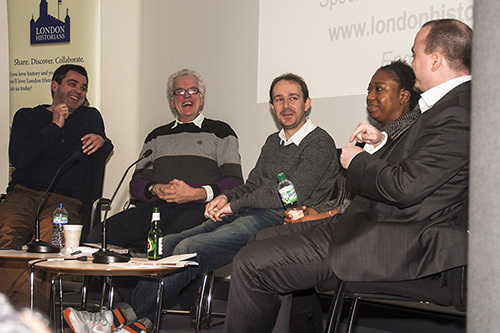 I’ll add to this, but finally an excellent review of our celebratory event at London Transport Museum on Thursday. Perfect summary. Thanks for getting us all around our fabulous city, here’s to the next 150 years.